OFF SEASON RATES ARE IN EFFECT LESS THEN $500. A WEEK! Beach chairs for daily visits to Marco's beautiful beaches, just two miles away. Just steps away from the beautiful waterfront and marina where dolphin are often seen at play. Angler's Cove offers two swimming pools, two tennis courts, two hot tubs and a Tiki Hut restaurant/bar on the waterfront on the premises. You will find you are within walking distance to the marina, bicycle & moped rentals, shopping and restaurants. You can easily island hop for finding great shells by boat, kayak, personal watercraft or boat... Miles of waterways in and around Marco Island....beautiful sunsets....cocktails, food, shopping, etc. BOAT SLIPS AVAILABLE FOR RENT. My wife and I enjoyed our visit to Marco Island. Condo was excellent. Clean, comfortable bed, great pool and the lanai was awesome. On site restaurant with great food and drinks. Peter was an excellent owner who was available at any time. I would recommend this place to everyone. We will be back. Thanks Peter. We stayed from December 2018 until end of January 2019 and are glad we found Peter's condo. It was perfect for our needs and we found the location to be convenient to many fine places. Peter is a gracious host and provided excellent, clear instructions for check-in, WiFi use, laundry facilities, pool facilities. He responded quickly to any question we had prior to our arrival and during our stay. 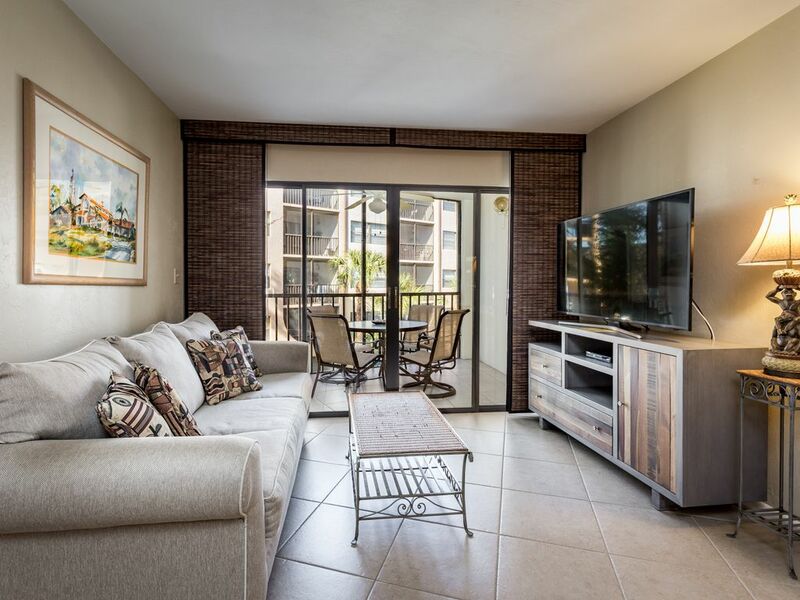 If you ever visit Marco Island don't hesitate to book Peter's condo. The Dolphin Tiki Bar is a short stroll away. Everything was great. Very convenient location to stores,water, and restaurants. We enjoyed our stay on Marco. Peter is great to work with and very accommodating. Great Condo in excellent location! Peter was a great host! Condo was perfect for our stay in Marco. If you are considering this condo, don’t hesitate just book it! Very pleased with this place! We loved the location, Peter was easy to work with, the beds were comfy, and the place was clean and tidy. We had everything we needed and the price was reasonable. I appreciated the little cooler since we used it regularly. The only reason I gave it a 4 rather than 5 was because I think the furnishings and towels could be updated. Because the condo is on the small side, I think having furniture that is not quite so bulky would make it feel a little roomier. We would definitely stay here again and recommend this condo to others. Thanks for everything Peter. I want to thank Sarina McDougal for staying at my condo and forgive me a review. I constantly am in touch with my clients during their stay. Unfortunately she never told me how she felt about the linens at the timer of her stay . I certainly would've addressed that issue while she was there but, unfortunately she didn't give me the opportunity to correct it to her satisfaction. Nothing I can do about the size of my furniture but I certainly could've taken care of the other issue . I hope always for a five star rating unfortunately she did not give me that chance. We can only book from Saturday to Saturday.